Adam Milstein has withdrawn from a panel at the upcoming AIPAC conference after tweets criticizing Democratic Reps. Ilhan Omar and Rashida Tlaib over their rhetoric and ties to CAIR. Israeli-American Council chairman Adam Milstein addressing the IAC conference in Washington, D.C. November 2018. Credit: Perry Bindelglass. 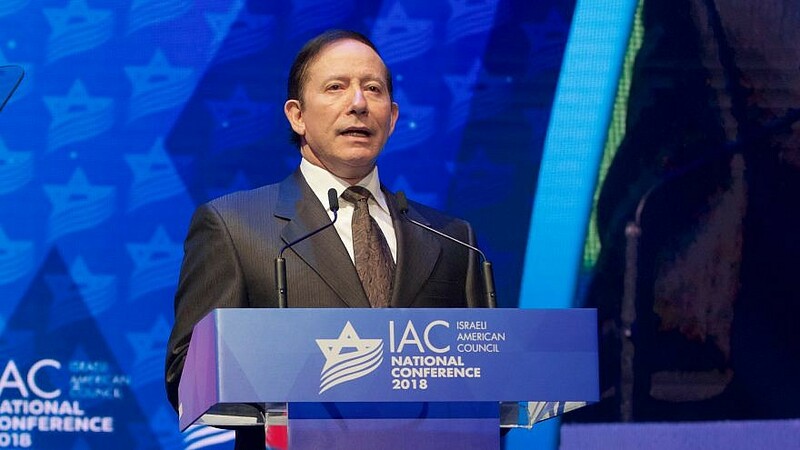 (March 20, 2019 / JNS) Pro-Israel philanthropist Adam Milstein has said that he remains committed to speaking out against the anti-Semitic rhetoric of Reps. Ilhan Omar (D-Minn.) and Rashida Tlaib (D-Mich.), as well as the Council on American-Islamic Relations (CAIR), following his announcement that he has withdrawn from moderating a panel at the upcoming AIPAC Policy Conference after a series of tweets criticizing the politicians. “It’s specifically because I believe in the importance of religious tolerance, freedom of speech and pluralism that I will continue to speak out against CAIR, and Representatives Omar and Tlaib,” he told JNS. On Tuesday, it was reported that Milstein, who has been a prolific donor to AIPAC over the last decade, giving $200,000 annually to the American Israel Education Foundation (AIEF) that makes annual grants to AIPAC, withdrew from moderating the panel following a series of tweets where he criticized Omar, Tlaib and CAIR. AIPAC spokesman Marshall Wittman did not respond to a JNS inquiry regarding the details of whether or not Milstein was prohibited or requested not to moderate the panel, as well as to which specific message communicated by Milstein that AIPAC objected to. Instead, Wittman pointed JNS to his existing comments to JTA. However, the JTA report noted that the claims provided by Milstein on Twitter provided “little or no evidence” of ties between Omar, Tlaib and the Muslim Brotherhood. The situation over Milstein is connected to the broader controversy over anti-Semitism in the Democratic Party tied to Omar that led to a House resolution on the issue. Ironically, it was Rep. Omar’s recent attacks on AIPAC that generated tremendous backlash from the Jewish community and concerns over anti-Semitism. The petition highlights the troubled history of CAIR, noting that it was founded in 1993 following a meeting of the U.S. Muslim Brotherhood’s Palestine Committee, which has ties with Hamas, a U.S.-designated terror group. It is also listed as an unindicted co-conspirator in the case that found Holy Land Foundation responsible for siphoning more than $12 million to Hamas. More recently, it also notes the support Omar and Rashida have received from CAIR amid their anti-Semitic accusations, in addition to fundraising from CAIR leaders. Milstein said that the ties between CAIR, and Reps. Omar and Tlaib, are major concern. “CAIR has provided a vehicle for the Middle East’s most extreme groups, including terrorist organizations like Hamas, to raise money and spread their ideas in America. Representatives Omar and Tlaib are closely linked to CAIR,” he said.